There is nothing more fun....or tiring.....than having your grandchildren for a week. My son and his wife are are on a trip celebrating their 20th wedding anniversary and my husband and I volunteered to keep our two grandchildren 15 and 10. The 10 year old is in 5th grade and was selected to be on the Safety Patrol Squad this year. One of her duties is to raise the American Flag each morning. I am soooo proud of her!!! Her mother is proud also but not quite as enthusiastic. I found out why this week. She has to be at school by 7:20 AM!!! That means getting her up about 6:15 AM!!! Which means I have had to get up by 6 AM!!!! Everyone who knows me is aware that I am NOT a morning person!! School time is much more reasonable for my 15 year old grandson. He doesn't have to be there until 8:35. High School is much more civilized! His scramble time is in the afternoon. He gets home about 3:30 PM, has a snack (of course, a snack for a boy of 15 is two Big Macs, large fries and a giant drink), and does his homework. By the time he is finished it is time to take him to the college for swim practice. He is on the Varsity Swim Team and I am soooo proud of him!!! His mother is proud too but not quite as enthusiastic. I found out why this week. Not only does he practice EVERY EVENING, but sometimes at 6 AM before school. Then there are the competition meets with other schools and oh yes, a conference meet all day Saturday. Oh, and don't forget the snacks for the whole team. I had two sons and I really do remember the Little League games, Tennis practice and matches, a little bit of football, etc. I just don't remember being so VERY TIRED!!! Grandchild Number 3 is coming this afternoon for the weekend. ..... he is 3 1/2!!! 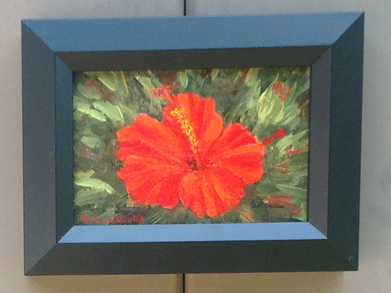 My "Red Hibiscus" painting was offered at auction a few weeks ago. Things don't always run smoothly so it is up for auction again. Bids begin at just 99 Cents with no reserve and I pay for the shipping and Florida sales tax. The winner of the auction gets my Framed 4"x6" oil painting on canvas board. I must make one CHANGE in the bidding process. Recent auctions have been hectic close to the deadline, not allowing me time to alert all bidders of new bids. So, during the last 30 minutes of the auction bids must be at least $5.00 higher than the previous high bid. Example: High bid of $100.00. The next bid must be at least $105, then $110, etc. Bids offered during the week must top the previous high bid by only $1.00.